80’s DISCO LEGENDS IN CONCERT! EURO-POP STARS OF THE 80’S LIVE IN CHICAGO! 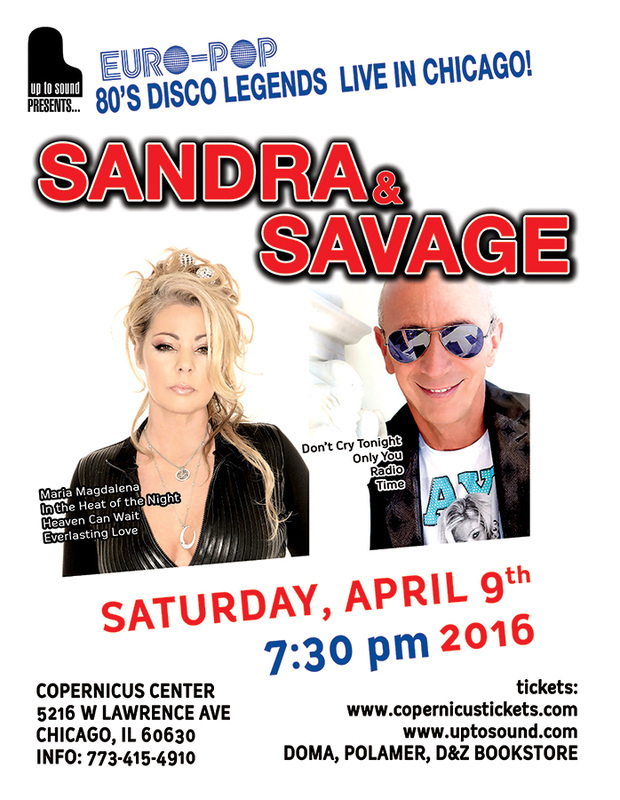 Sandra & Savage, two of the most popular singers of the New Wave/Italo Disco genre from the 80’s will rock Copernicus Center on April 9, 2016, at 7:30 pm. Both known for their golden and platinum records of Euro-Pop music from the 80s, Sandra, with hits: “Maria Magdalena”, “In the Heat of the Night”, “Heaven Can Wait”, “Everlasting Love”, and Savage with: “Don’t Cry Tonight”, “Only You”, “Radio”, “Time”, “Goodbye”, will make history by coming to Chicago, for the first time together! Sandra Ann Lauer, commonly known under her stage name Sandra is a German pop singer, who enjoyed a mainstream popularity in the 1980s and early 1990s with a string of European hit singles: “(I’ll Never Be) Maria Magdalena", "In the Heat of the Night", "Everlasting Love", "Secret Land", “Hiroshima”, "Don't Be Aggressive”, “Heaven Can Wait”, and many more. The popularity of many songs, which topped the charts worldwide, gained Sandra international success. "In the Heat of the Night", earned her second place at the Tokyo Music Festival in 1986, and her albums “Into a Secret Land” and “Close to Seven” have won high critical acclaim. During the height of her popularity, Sandra even managed to outsell Madonna in a number of countries around the world. With sales in excess of 30 million records worldwide, Sandra has established her position as the most successful German disco/pop female vocalist. Roberto Zanetti, known under the name Savage, is the original 80′s Italodisco pop star, worldwide famous singer and platinum record producer of Europop. A man with the passion for music, started his solo career in December 1983, after he recorded and produced a dance single “Don’t cry tonight”, which was very successful across Europe and has been frequently remixed since. The same year, he recorded "Only You", a slow disco number which became significantly popular as well. His first album, “Tonight” was very successful commercially and preceded singles like "Radio", "Time", "A Love Again", "Celebrate", and "Love Is Death”, followed by “I’m loosing you”, “Goodbye”, “I just died in your arms”, and “Strangelove”. Thanks to the catchy melodies of his songs and timbre of his voice, Savage became one of the most appreciated singers in Europe (during his shows girls threw themselves at him), and one of the creators of the Italodisco.